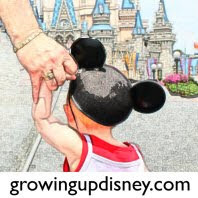 Disney Vacation Club on eBay - or going Crazy! I love going to Walt Disney World and have ever since I first visited the Preview Center in 1970 before the Magic Kingdom ever opened. I've been so much I don't purchase a lot of souvenirs any more unless Tink and Minnie are there for me to buy them gifts. I heard Disney was doing a Vacation Ownership program long before I ever saw the Disney Vacation Club Resort - aka Disney's Old Key West Resort. We toured DVC in late 1992, just over a year after it opened, and became members soon afterwards. The original logo for the Disney Vacation Club resort was an oval with 3 snow-capped mountains, ocean waves and palm trees with a Mickey Icon sun rising behind the mountains. Once Disney's Vero Beach Resort became a DVC resort, the Disney Vacation Club Resort was renamed Disney's Old Key West Resort and the logo dropped one mountain. (Never did know where that mountain went!) The two mountain logo remained until Aulani, Disney Vacation Club Villas, Ko Olina, Hawai`i joined the DVC family of resorts and the logo became a world globe with Mouse Ears. Recently, while wandering onto eBay, I ran across an early Cloisonne pin (this was before "trading pins" were everywhere). It has some interesting colors with red mountains, and a purple sky but most importantly it has the 3 mountains of the original logo. Well I had to bid on it! Raise your bid... and win! So I am the proud owner of a like-new DVC pin still on the original card. The price tag is still on the back - $4.00. And I only paid $10.49 plus $3.95 shipping. What a bargain! Seriously I bought a beautiful pin of the original DVC logo. Of course it didn't stop there. If you stay on eBay long enough you will find something you really want. Bid...Bid... higher... Higher... HIGHER.... BID!!! and you win the prize. This time I found a Disney Vacation Club sign - the 2 mountain sign. It was a prototype of the signs used at Disney's Hilton Head Island Resort. It's a large, heavy, solid wooden sign just over 2 feet across. Of course I paid WAY too much. I won't say how much (Mom might read this) but it cost $18.00 just to ship it to me. Cost was not important. I have THE sign. OK. None of these probably mean anything to others. To me they are priceless treasures. I am a long time Disney Vacation Club Member. A Member since 1993 when the 3-mountain logo was still there. The Cloisonne pin will go on a hat - I don't buy pins to trade. The Button is on the wall in my office. The Sign??? Where do you hang a 2 foot DVC Sign? Mom suggested over the large print of the Old Key West lighthouse in the living room that Amy gave me several years ago. Where would you hang a sign? I'm not sure where it will end up, but I like it a lot. Just got to stay off of eBay. Of course I bought some other Disney items and still bidding on some. But those are for another post.